We have investigated the effects of indomethacin (IM), a non-steroidal anti-inflammatory drug, and the role of prostaglandins on the accumulation of leukocytes in the rat ovary during the periovulatory period. Adult cycling rats were injected sc with 1 mg of IM in olive oil or vehicle on the morning of proestrus. Some animals were killed at 16:00 h in proestrus. On the evening (19:00 h) of proestrus, IM-treated rats were injected with 500 micrograms of prostaglandin E1 in saline or vehicle. Animals were killed at 01:30 and 09:00 h in estrus. There was an influx of macrophages, neutrophils, and eosinophils into the theca layers of preovulatory follicles, and of neutrophils and eosinophils into the ovarian medulla from 16:00 h in proestrus to 01:30 h in estrus. All these changes, except the accumulation of neutrophils in the theca layers of preovulatory follicles, were blocked by IM treatment. At 09:00 h in estrus, large clusters of neutrophils were observed in IM-treated rats, around abnormally ruptured follicles. The accumulation of leukocytes was not restored by prostaglandin supplementation, despite the inhibition of abnormal follicle rupture and restoration of ovulation in these animals. These results suggest that different mechanisms are involved in leukocyte accumulation in the ovary during the periovulatory period, and that the inhibitory effects of IM on the influx of leukocytes are not dependent on prostaglandin synthesis inhibition. Ovulation is a complex process, in which healthy ovarian tissue has to be destroyed to allow release of the oocyte from the ovary. The biochemical and cellular events that happen in the ovary around the time of ovulation, such as hyperemia, cytokine release, accumulation of leukocytes, activation of proteolytic enzymes, and tissue breakdown, make the ovulatory process close similar to a local inflammatory reaction [1, 2]. Different leukocyte subsets are present in the ovary, and have been proposed to actively participate in the main ovarian events [3–8]. Circumstantial evidence suggests that leukocytes constitute an important component of the ovulatory process. Macrophages [3, 4], neutrophils [4, 9, 10], eosinophils , and mast cells [11, 12], have been reported to undergo hormone-driven cyclic changes, and to accumulate in the ovary, and more specifically in the theca layers of preovulatory follicles, during the periovulatory period in several species. Otherwise, no relevant changes in lymphocytes have been reported . More direct evidence for the existence of a role of leukocytes in ovulation arises from studies with experimental models in which genetic or induced alterations in the ovarian leukocyte populations, are related to changes in the ovulation rate. For instance, osteopetrotic mice, that are deficient in colony-stimulating factor-1 (CSF-1) and have decreased numbers of macrophages, show defective ovulation [13, 14] that is partially restored after CSF-1 administration . Similarly, mice with mutation at the microftalmia (mi) locus, displaying functionally defective macrophages and reduced numbers of mast cells, also show defective ovulation that is restored after bone marrow transplantation . Leukocyte supplementation increases the LH-induced ovulation rate in the in vitro perfused rat ovary , whereas treatment with antibodies against neutrophils decreases the ovulation rate . In the rabbit, treatment with antibodies against interleukin-8 (a chemotactic factor for neutrophils), inhibits both neutrophil accumulation and ovulation . Furthermore, leukocyte-derived cytokines, such as interleukin-1 and tumor necrosis factor alpha (classical secretory products of macrophages), and histamine (a major secretory product of mast cells), have been reported to be important modulators of the ovulatory process [3, 11, 19]. In contrast, other studies have reported that leukocytes attracted into the follicle from the vascular system are not required for successful ovulation in the sheep , and that even severe leukocyte depletion does not affect ovulation in the rat . Indomethacin (IM), a non-steroidal anti-inflammatory drug, has repeatedly shown to inhibit ovulation (reviewed in [21, 22]). In recent studies, our group has reported that abnormal follicle rupture, but not its inhibition, is responsible for the anti-ovulatory action of IM in the rat . In these animals, supplementation with prostaglandin E1, and to a lesser extent with prostaglandin E2, inhibits abnormal follicle rupture and restores ovulation , thus suggesting that the main antiovulatory action of IM is mediated by inhibition of prostaglandin synthesis. However, additional prostaglandin-independent effects have also been reported in IM-treated animals . Indomethacin is a potent anti-inflammatory drug, and its ovarian actions could be mediated, at least in part, by modulation of the inflammatory-like changes that happen during ovulation. Few studies have explored the impact of IM treatment on the accumulation of leukocytes in the ovary during the periovulatory period, and furthermore, these studies have provided partially contradictory results. For instance, whereas antiovulatory IM doses in the sheep inhibit the accumulation of leukocytes in the theca of preovulatory follicles , other authors  have reported that the ovarian content in mieloperoxidase (a neutrophil-specific enzyme) showed a 20-fold increase after IM treatment in rats. The aim of this study was to analyze the effects of indomethacin treatment, and of exogenous prostaglandin supplementation, on the ovarian leukocyte population during the periovulatory period in the rat. Leukocyte subtypes previously shown to undergo significant changes during the periovulatory period (i.e. macrophages, neutrophils, eosinophils and mast cells) were evaluated. Adult cycling Wistar female rats were used. Animals were maintained under controlled light (14 h L:10 h D) and temperature (22 C) conditions, and had free access to pelleted food and tap water. Vaginal smears were taken daily. Only animals displaying at least two consecutive four-day estrous cycles were used. Experiments were conducted according to the Guide for the Care and Use of Laboratory Animals, and were approved by the Ethical Committee of the University of Cordoba. On the morning (11:00 h) of proestrus, the animals were injected sc with 1 mg of indomethacin (IM) in olive oil or vehicle. On the evening (19:00 h) of proestrus, IM-treated rats were injected with 500 micrograms of prostaglandin E1 in saline or vehicle. This time schedule were selected because the LH surge occurred, in our colony, at 18:30 h on the evening of proestrus . Prostaglandin supplementation with a dose of 500 μg of prostaglandin E1 was used because a previous study  reported that it was effective in inhibiting abnormal follicle rupture and restoring ovulation. Animals were killed at 01:30 and 09:00 h in estrus. Additional vehicle and IM-treated rats were killed at 16:00 h in proestrus (before LH surge). The ovaries were dissected and fixed for at least 24 h in Bouin-Hollande's fluid or 4% paraformaldehyde (PFA) in Sorensen buffer (pH 7.2). After dehydration, the ovaries were embedded in paraffin and serially sectioned at 5 μm-thick. Sections from PFA-fixed ovaries were placed on poly-L-lisine-coated slides and used for immunohistochemistry. Sections from Bouin-Hollande-fixed ovaries were stained with alcian blue-hematoxylin and eosin. Immunohistochemical demonstration of macrophages was performed with a specific monoclonal antibody (ED1, Serotec, Oxford, UK), as previously reported . Briefly, endogenous peroxidase was inhibited by incubation with 2% hydrogen peroxide in methanol for 30 min. Afterwards, sections were rinsed in PBS, blocked with 10% normal rabbit serum for 2 h, and incubated overnight with mouse monoclonal ED1 antibody (diluted 1:400). The sections were processed according to the avidin-biotin complex method. Sections were treated sequentially with rabbit anti-mouse IgG-biotin conjugate (Sigma, London, UK; 1:1000 for 1 h at room temperature), and avidin-biotin peroxidase complex (Vector Labs, Burlingame, CA; 1 h at room temperature). Tissue-bound peroxidase was visualized by incubation in 0.03% diaminobenzidine-tetrahydrochloride (Type IV; Sigma, St. Louis, MO) and 0.01% hydrogen peroxide in 0.1 M Tris-buffer (pH 7.6) for 1 min. Afterwards, sections were darkened in 1% copper sulfate for 5 min and counterstained with hematoxylin. Negative controls for immunohistochemistry were run by incubating the sections with nonimmune serum instead of the primary antibody. ED1 immunostaining (Fig. 1A) allowed identification of both monocytes and resident tissue macrophages . Neutrophils, eosinophils and mast cells were identified in alcian blue-hematoxylin and eosin-stained sections by their characteristic morphological features or specific staining properties (see Fig. 1B,1C). Identification of leukocyte subtypes. A, ED1 immunostaining allows the identification of both monocytes and resident tissue macrophages. B,C, staining with alcian blue-hematoxylin and eosin, allows the identification of neutrophils (B) by their characteristic nuclear morphology, eosinophils (C, red-stained), and mast cells (C, blue-stained). Scale bar = 15 μm. Leukocytes in the theca layers of preovulatory follicles corresponded to the number of leukocytes in 20 non-consecutive sections, selected from those showing the cumulus. Since the external limits of the theca externa cannot be clearly appreciated in some areas, leukocytes in an area of 50 μm width from the granulosa were counted (this roughly corresponded to the theca layers), with the aid of a micrometer eyepiece incorporated to the microscope. These counts were performed in 5 preovulatory follicles per rat and five rats per group. In the ovarian medulla, the number of leukocytes was obtained by counting the number of leukocytes per microscopic field (with the x100 objective), and expressed as leukocyte density (number of leukocytes per mm2). At least 20 microscopic fields per rat, and five animals per group was scored. Data are presented as the mean ± SEM for n = 5. Statistical analysis was carried out by ANOVA followed by the Student-Newman-Keuls method for multiple comparison among means. Significance was considered at the 0.05 level. The morphological changes that happen in the ovary during the periovulatory period in vehicle- and indomethacin-treated rats have been already described . In the present study, follicle rupture was not observed at 01:30 h in estrus, neither in vehicle- nor in IM-treated rats. Edema of the tunica albuginea at the apex, that was clearly observed in vehicle-treated rats (Fig. 2A), was completely absent in IM-treated animals (Fig. 2B). Variable edema was also present in the medulla of vehicle-treated rats, but was absent in IM-treated animals. Otherwise, dispersion of the cumulus and resumption of the meiotic process of the oocyte were equivalent in control and IM-treated rats (Fig. 2A,2B). 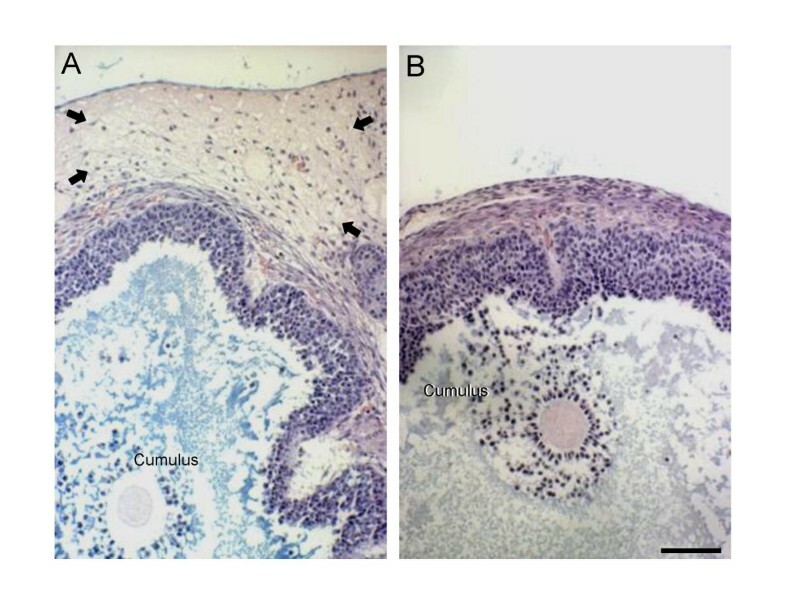 Apical zone of preovulatory follicles at 01:30 h in estrus, in vehicle- (A) and indomethacin – (B) treated rats. The edema of the collagenous tissue at the apex, that can be clearly appreciated in vehicle-treated rats (arrows in A), was absent in indomethacin treated animals (B). Scale bar = 100 μm. 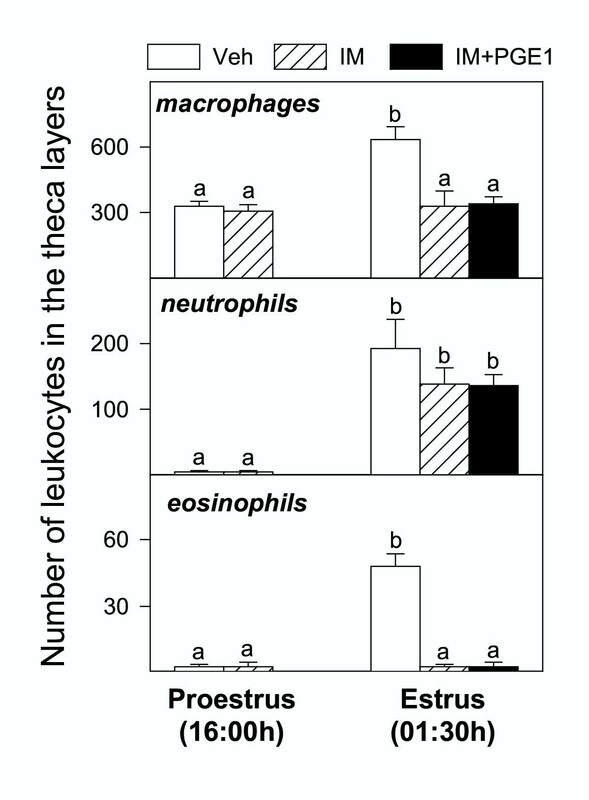 On the evening of proestrus (before the preovulatory LH surge), ED1-immunostained macrophages were the most relevant leukocyte subtype in the theca layers of preovulatory follicles (Fig 3A), whereas neutrophils and eosinophils were only occasionally observed. No differences were found between vehicle and IM-treated rats. At 01:30 h in estrus, accumulation of leukocytes was evident in the theca layers of preovulatory follicles. Monocytes/macrophages (Fig. 3B), neutrophils (Fig. 3C) and eosinophils (Fig. 3D,3E,3F) were abundant in vehicle-treated rats. Macrophages and neutrophils were also observed in IM-treated rats, whereas eosinophils were rarely found. Leukocytes were uniformly distributed throughout the follicle wall, and accumulation at the apex was not appreciated. Quantitative data (Fig. 4) indicate that, in vehicle-treated rats, there was a 2-fold increase in the number of macrophages, a 20-fold increase in the number of neutrophils and a 20-fold increase in the number of eosinophils after the LH surge. In IM-treated rats, the increases in the number of macrophages and eosinophils were inhibited, whereas the increase in the number of neutrophils was equivalent to that of vehicle-treated rats. Supplementation with prostaglandin E1 did not modify the number of leukocytes found in IM-treated rats. Mast cells were not observed in the theca layers of preovulatory follicles in any group. Leukocytes in the theca layers of preovulatory follicles in vehicle-treated rats, at 16:00 h in proestrus (A) and 01:30 h in estrus (B-F). 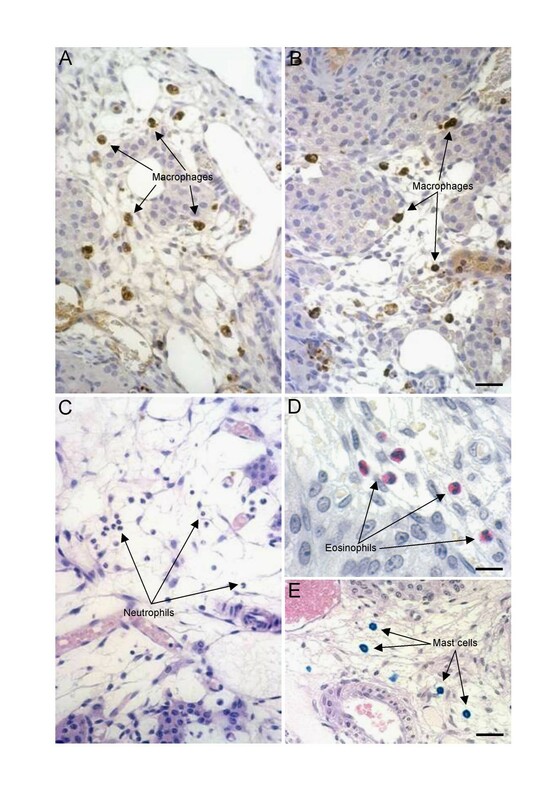 A, B, ED1 immunostained macrophages (arrows) can be observed around preovulatory follicles. Neutrophils (C,D) and eosinophils (D-F) can be observed inside blood vessels (D) or extravassated (C,E,F). The ovarian surface epithelium (OSE) is indicated. Scale bar = 25 μm. Number of leukocytes in the theca layers of preovulatory follicles in vehicle (Veh), indomethacin (IM) or indomethacin plus prostaglandin E1-treated rats (IM + PGE1). Different superscripts means significant (p < 0.05) differences (ANOVA and Student-Newman-Keuls test for n= 5). In the ovarian medulla, macrophages were abundant, particularly in the stroma around blood vessels and in the interstitial glands (Fig. 5A). 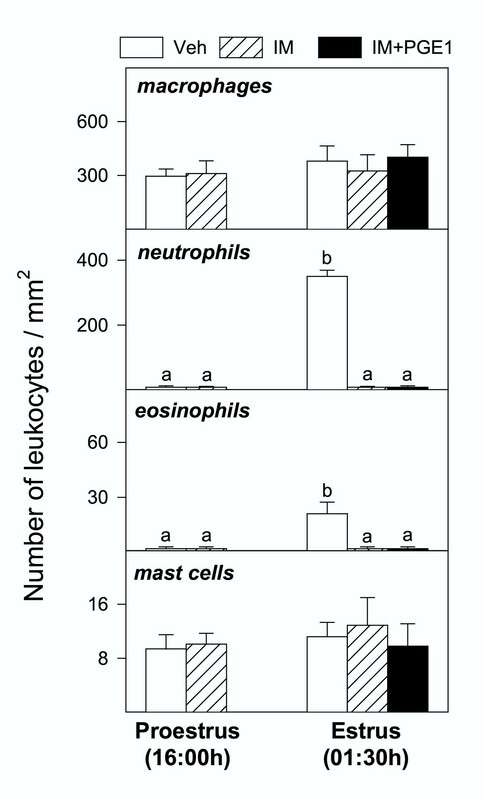 No significant increase in the number of macrophages was found from 16:00 h in proestrus to 01:30 h in estrus (Figs. 5A and 6), neither in vehicle nor IM-treated rats (Figs. 5B and 6). However, neutrophils (Fig. 5C) and eosinophils (Fig. 5D), that were extremely scarce on the evening of proestrus, accumulated in the ovarian medulla at 01:30 h in estrus in vehicle-treated rats (Fig. 6). The accumulation of neutrophils and eosinophils was inhibited in IM-treated rats, irrespective of PGE1 supplementation (Fig. 6),. Mast cells were relatively abundant in the ovarian medulla (Fig. 5E) but no significant changes in their number were found in any group (Fig. 6). Leukocytes in the ovarian medulla of vehicle (A, C-E) and indomethacin (B) treated rats, at 01:30 h in estrus. Macrophages (A, B), neutrophils (C), eosinophils (D) and mast cells (E) can be observed. Scale bar in A,B = 40 μm; in C,E = 50 μm; in D = 20 μm. Number of leukocytes in the ovarian medulla, in vehicle (Veh), indomethacin (IM) or indomethacin plus prostaglandin E1 (IM + PGE1) treated rats. Different superscripts means significant (p < 0.05) differences (ANOVA and Student-Newman-Keuls test for n= 5). The morphological features of the ovaries of IM-treated rats at 09:00 h in estrus, with respect to follicle rupture and ovulation, have been already published . Briefly, abnormal follicle rupture at the basolateral sides, with release of the cumulus and follicular fluid to the ovarian interstitium, had occurred in about 50% of preovulatory follicles (Fig. 7). Invasion of blood vessels by granulosa cells and follicular fluid was frequent. Large clusters of neutrophils were observed inside blood vessels, surrounding granulosa cells and follicular fluid (Fig. 7A), as well as in the ovarian interstitium, around the rupture site (Fig. 7B). In IM-treated rats supplemented with PGE1, abnormally ruptured follicles, or inflammatory reactions were not found. Abnormally ruptured follicle from the indomethacin-treated rat at 09:00 h in estrus. In A, the rupture site in the follicle can be observed. The route of granulosa cells and follicular fluid, invading the interstitial tissue and blood vessels, is indicated by arrows. The framed area, inside the blood vessel, is shown at higher magnification (insert), to show the presence of abundant neutrophils in the blood vessel lumen, surrounding granulosa cells and follicular fluid. In an adjacent section (B), the cumulus containing the oocyte in metaphase II can be observed. Clusters of neutrophils are indicated by open arrows. Scale bars in A = 120 μm; in B = 60 μm. The accumulation of leukocytes in the ovary of vehicle-treated rats, in response to the preovulatory LH surge, was in rough agreement with previous studies in the rat  and related species . Accordingly, macrophages constitute the most prominent leukocyte subtype in the ovary, although neutrophils and eosinophils also showed marked increases shortly before ovulation. To the best of our knowledge, the preovulatory influx of eosinophils has not been previously reported in the rat, although these cells have been found to accumulate in sheep preovulatory follicles , and are prominent in the porcine ovary . Overall, IM treatment inhibited LH-dependent leukocyte accumulation. However, the effects of IM were dependent on both the leukocyte subtype and its anatomical location. 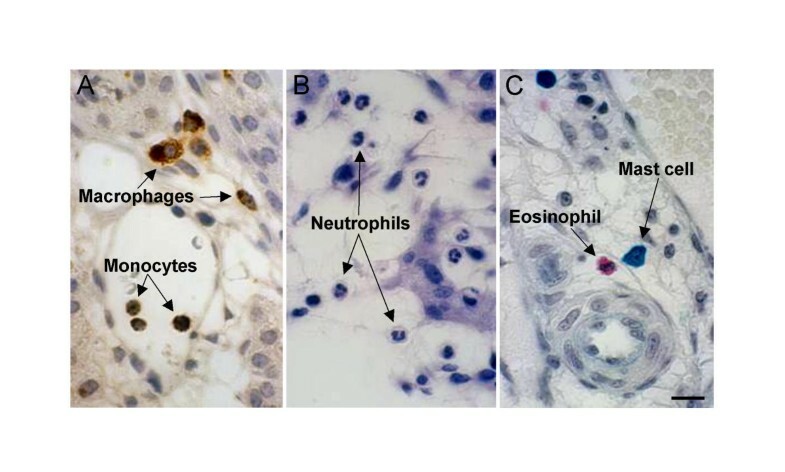 For instance, whereas the influx of neutrophils in the ovarian medulla was inhibited, the accumulation of these cells around preovulatory follicles was not affected. This suggests that different mechanisms are involved in the attraction of neutrophils to different ovarian compartments. The accumulation of leukocytes in the ovary during the periovulatory period seems to be mediated by the expression of different chemokines (chemotactic cytokines) in the ovary, in response to the preovulatory LH surge [18, 30]. The expression of the chemokines MCP-1 and -2, and GRO, that are chemotactic for macrophages and neutrophils respectively, has been reported in the rat preovulatory ovary . Furthermore, the accumulation of leukocytes (particularly of those involved in acute inflammatory reactions) around periovulatory follicles, could be a consequence (rather than a cause) of the early steps of tissue degradation. Ovulation is a unique physiological process in which healthy tissue is degraded. In this sense, ovulation could be considered a pathophysiological process, and it is thus reasonable to assume that a local acute inflammatory reaction should be triggered by tissue degradation. Studies in the sheep  have reported that collagen-like peptides, presumably derived from collagen breakdown in the follicle basement membrane, are intensely chemotactic for neutrophils. 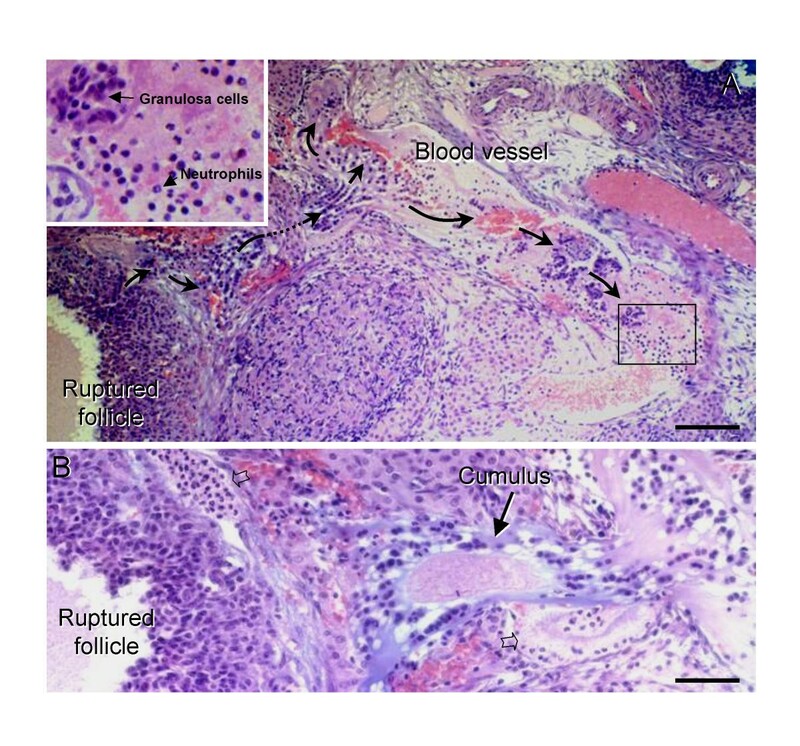 Since follicle rupture was not inhibited in IM-treated rats, this mechanism could be responsible for the accumulation of neutrophils around preovulatory follicles in these animals. Acute inflammatory reactions, in response to tissue breakdown, are not completely inhibited by IM, as indicated by the accumulation of neutrophils around granulosa cells and follicular fluid in abnormally ruptured follicles on the morning of estrus. A previous study of the effects of indomethacin on ovarian leukocytes in the rat  reported that the concentration of mieloperoxidase (MPO; a neutrophil-specific enzyme) increased 20-fold in IM-treated rats, 3 hours after hCG treatment. These results are difficult to conciliate with the data of the present study. Differences could be due to the different experimental models used (adult cycling rats vs gonadotropin-primed, hCG-treated, immature rats). In our study, large numbers of neutrophils accumulated around abnormally ruptured follicles on the morning of estrus. This could explain the increase in MPO after the expected time of follicle rupture. However, it seems unlikely that follicle rupture would happen in immature rats as early as 3 hours after hCG injection, although a previous study  has reported that follicle rupture was slightly advanced in IM-treated rats. Otherwise, hCG is intensely chemotactic for neutrophils in other tissues and these cells accumulate in the testes of hCG-treated rats . Furthermore, in rats with pharmacological depletion of macrophages, the accumulation of neutrophils, in response to hCG treatment, was increased . In this sense, the accumulation of neutrophils reported in hCG-treated immature rats  could be a response (enhanced in the presence of IM) to this non-physiological hormone. The inhibitory effects of IM on the accumulation of leukocytes were not restored by prostaglandin supplementation despite the inhibition of abnormal follicle rupture and restoration of ovulation . This strongly suggests that the effects of IM on ovarian leukocytes are not mediated by prostaglandin synthesis inhibition. IM can inhibit leukocyte accumulation at several levels, such as chemokine expression, and leukocyte migration. It is well established that non-steroidal anti-inflammatory drugs have also prostaglandin-independent effects . 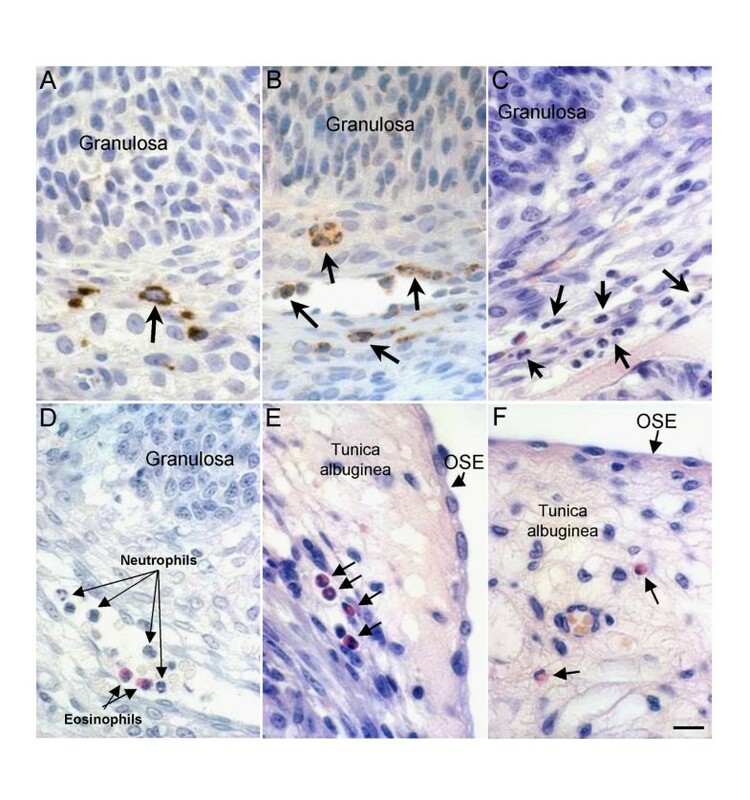 A recent study  has reported that changes in the ovarian surface epithelium at the apex in sheep preovulatory follicles were inhibited by IM treatment by a prostaglandin-independent pathway. The precise role of leukocytes in ovulation is not known. Leukocytes release a large number of products that have been found to play a role in ovulation [3, 19], and numerous studies have suggested a role for leukocytes, facilitating the ovulatory process [13–18]. On the contrary, some previous studies [10, 20] have reported that severe leukocyte depletion did not affect ovulation. In the later studies, however, treatments with bone marrow depleting agents leading to a decrease in circulating leukocytes were used. However, acute bone marrow depletion should have minor effects on the resident ovarian macrophage population, due to the low turnover of tissue macrophages. In our study, the inhibition of edema formation and leukocyte accumulation in IM-treated rats, as well as, the lack of effects of prostaglandin supplementation on both processes, strongly suggest that both processes are, directly or indirectly, related. In summary, the data of this study suggest that different mechanisms are involved in the accumulation of leukocytes in the ovary during the periovulatory period. The LH-dependent expression of chemokines  induces the accumulation of leukocytes in both the ovarian medulla and around preovulatory follicles. This influx of leukocytes was inhibited by IM treatment, apparently through prostaglandin independent mechanisms. In addition, early degradation of the follicular basement membrane, determines the release of collagen-derived peptides that attracts additional inflammatory cells (i.e. neutrophils) into preovulatory follicles. This inflammatory-like neutrophil accumulation was not inhibited by IM treatment. Furthermore, abnormal follicle rupture with invasion of perifollicular tissues by granulosa cells and follicular fluid, determined an inflammatory reaction, with accumulation of large number of neutrophils, around the invading follicular components. The authors are very grateful to J Molina and P Cano for their technical assistance. This work has been subsidized by Grant BFI2002-00485 from the DGI, Spain.